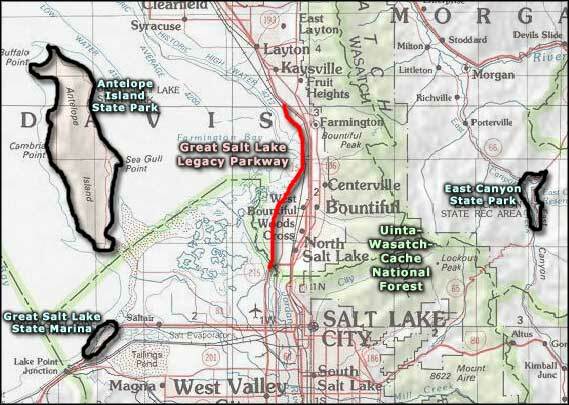 The Great Salt Lake is a remnant of ancient Lake Bonneville (which was named after the famous salt flats, which were, in turn, named for a manager of the American Fur Company back in the days of the mountain man/trappers). 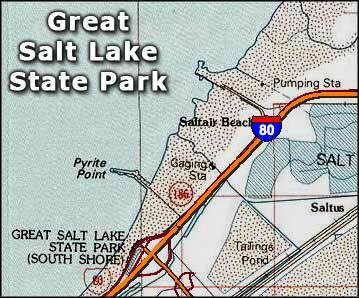 Great Salt Lake is between 2 and 7 times saltier than the ocean and covers more than 2,000 square miles. The biggest bit of open water in the middle of the Great Basin, Great Salt Lake attracts millions of migratory birds, more than 257 different species. The Great Salt Lake State Marina is a place where boaters and bird watchers can come to enjoy their "hobbies." This is the home of the Great Salt Lake Yacht Club, and a place where folks can come to enjoy beautiful views of Great Salt Lake, nearby Black Rock and Antelope Island State Park, and incredible sunsets over the water. The Marina also operates a search and rescue operations center that covers the entire Great Salt Lake area. Nearby is the new Saltair Resort, a place for concessions and concerts with a beach area, too. Utah State Parks and Recreation opened the Great Salt Lake State Marina as a state park in 1975, and by 1980 they had to enlarge the docks. Presently, there are 300 slips in the marina along with a boat ramp. The Great Salt Lake State Marina is open 365 days a year from dawn to dusk. No overnight camping is allowed. The Marina is located off exit 104 on Interstate 80, about 16 miles west of Salt Lake City. Day use is $2 per vehicle.